Here is an effort at urban imaging. This shot of M45 was taken from my driveway in Bedford, Nova Scotia. With the dropping temperature my SkyWatcher Esprit 120 has developed a slight case of pinched optics. While I've been working on getting the lens cell heated to solve the problem I've been gathering quite a bit of data. This image is a stack of several test frames taken as the temperature decreased from -1 C to -12 C over the course of the evening. The frames taken later in the evening showed rather poor stars as the lens cell put a slight pressure on the lens elements. A slight masked blur helped to round the stars and remove most of the spikes caused by the pinched optics. Optics Prime focus of a SkyWatcher Esprit 120 f/7 APO refractor. Processing This image was processed entirely in Images Plus. Calibration, stacking, statistical filter applied to reduce noise before stretching. Masked stretching and split star processing used to enhance the image. 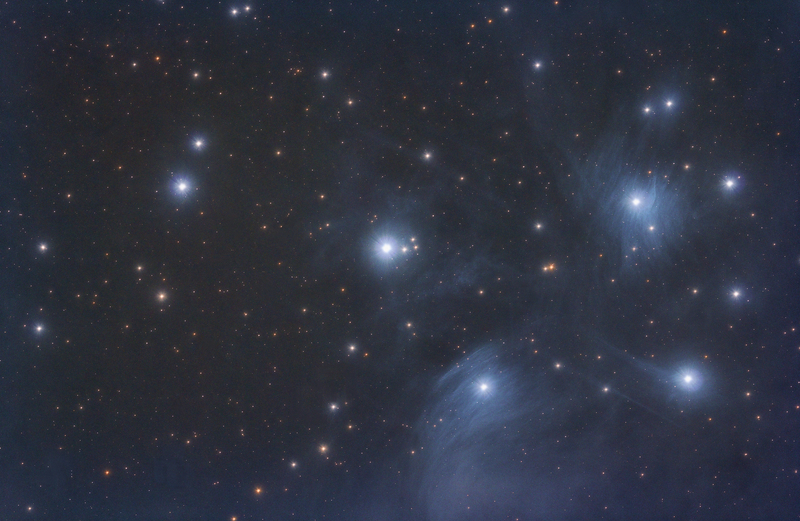 Masked noise reduction using a frequency domain lowpass filter applied to the DSO layer while the star layer was given a slight blur then the layers were recombined. Image binned 2 by 2. Final sharpening applied using LR deconvolution with a mask to protect the stars. Since the 60Da has on sensor dark suppression no darks or bias frames were used in the calibration.